How perfect was it that I was invited to be a part of the Beer Month Bloggers as organized by fellow blogger NY Foodgasm AND I had recently put together a beer-based recipe? It was for St. Patty's Day of course because Guinness is goodness. 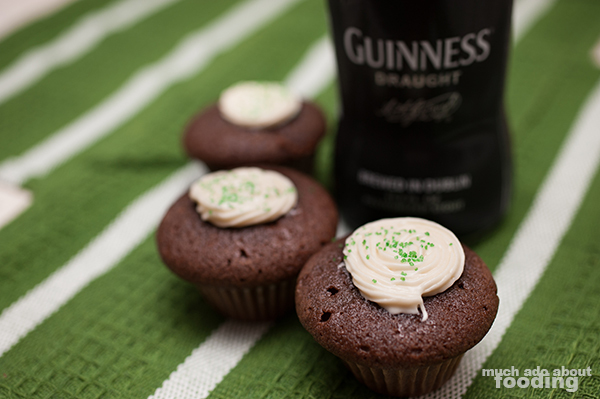 I know there are many versions of Guinness cupcakes but I am telling you that this one was just very, very good. Also, they were nearly guilt free from being, well, mini! Try it out yourself and let me know what you think. You will be handling the wet and dry separately. For the part of the wet, heat together Guinness and butter until butter has melted. Add cocoa powder slowly until all has dissolved. Leave to cool. Preheat oven to 350°F. For dry ingredients, combine flour, sugar, baking powder, and salt. 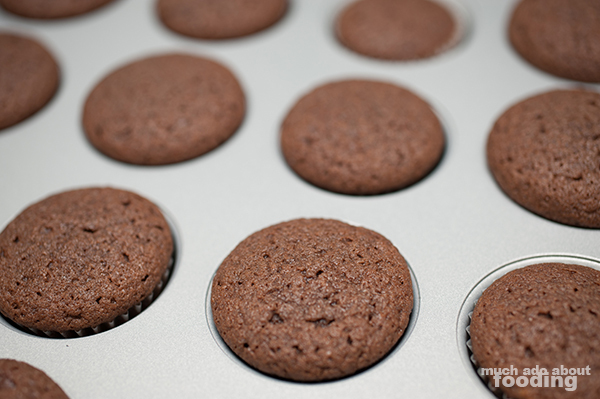 Either line a mini cupcake pan with liners or oil. In a large mixing bowl, beat eggs with sour cream before adding chocolate mix. Then add dry ingredients. Mix together well before pouring into cupcake pan(s). Bake 12-14 minutes. You can check doneness with the toothpick technique - put a toothpick through the middle of one and pull out. If it's clean, it's done. The cupcakes should be completely cool before you frost them. 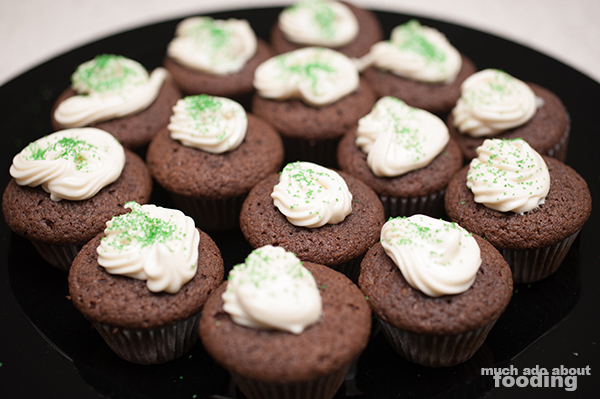 You can use whichever favored frosting recipe you have. For the above frosting recipe, beat cream cheese and butter together until fluffy. Add powdered sugar a little at a time while mixing until all thoroughly mixed in. Then mix in vanilla extract. Pipe through piping bag. I sprinkled green crystals on top afterward. Super cute! Love the combination of chocolate cake and cream cheese frosting.